New Orleans R&B legend Frankie Ford wrapped up his set with — what else? — “Sea Cruise.” Nice purple jacket, too! I went there mostly to see Sleepy LaBeef, American treasure, of course. He was to have played with three other rockabilly veterans. Only one, Alton Lott, made it. I’d never heard of Lott, but he can play, and I really enjoyed his set. He was part a duo, Alton and Jimmy, back in the ’50s. Then Sleepy came on and tore through about an hour-long set that was over way too soon. So it goes. Gotta keep that festival running on time. He invited an old pal, Glenn Barber, on stage to join him for a couple of numbers. They recorded together at Starday Records in Texas back in the late ’50s. A nice gesture, but Barber had all he could handle to keep up with Sleepy, who at 71 remains a force of nature. After the show, Sleepy met the fans, posed for pictures and signed autographs. Thankfully, I had the presence of mind to bring along the album cover from the only Sleepy vinyl I own — the great live album “Nothin’ But The Truth” — and he signed it. I’m not a big autograph guy, but I do like to get a special one now and then. Also had a chance to say hello again to Sleepy’s partner on the road, drummer Jerry Cavanagh. After they get done playing, Jerry sells Sleepy’s CDs to the faithful. Sadly, Jerry didn’t have anything new to sell me, just as he didn’t have anything new to sell me when Sleepy played the Bayside Tavern in Fish Creek, Wisconsin, a few years back. The best young group on this night? The Vincent Black Shadows, an eight-piece band out of Chicago — nine with a guest sax player. A big sound, with three girl singers fronting the band. Lots of energy. As I poked around the record shops in the main ballroom, I kept hearing this great R&B from the stage. Turned out to be Ray Sharpe, a Texas performer who hit it big with “Linda Lu” in 1959. What followed was even better, and I gave it my full attention. Barbara Lynn, who hit it big on the R&B charts with “You’ll Lose A Good Thing” in 1962, sounded great and looked great. She can really play that left-handed guitar, and she can belt it out. She’s a lovely 65. She could pass for 45, easily. I need to get some Barbara Lynn into my collection. Finally, after midnight, it was time for The Head Cat, a three-piece group fronted by Lemmy Kilmister of Motorhead on guitars (and harmonica!) with Slim Jim Phantom from the Stray Cats on the stand-up drum kit. The other, less well known guy is guitarist Danny B. Harvey. Robert Williams — aka Big Sandy, the night’s emcee — said it best: With all these legends on hand, all the buzz was about Lemmy. Hey, the guy’s a legend in his own right, and it was fun to see him cover the tunes he grew up with. Lemmy has a voice like six miles of bad gravel road, but he can play. But here’s a cut from from the only album I bought during the festival (alas, too many tunes, not enough scratch). 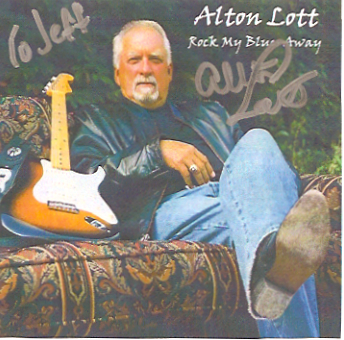 I so enjoyed Alton Lott’s set that I bought one of his homemade CDs and he graciously signed it. It doesn’t do his live performance justice, but it has its moments. “Why Do I Love You,” Alton Lott, from “Rock My Blues Away.” This cut was recorded in 1959 at Sun Studios in Memphis, with Sam Phillips at the controls. Lott was just 18 or 19 at the time. One other thing I saw at Lott’s show … and at Sleepy’s show … and at Barbara Lynn’s show … and at Lemmy’s show: The same young woman, looking a little like the actress Lauren Graham but dancing like Elaine Benes. Not a pretty sight.